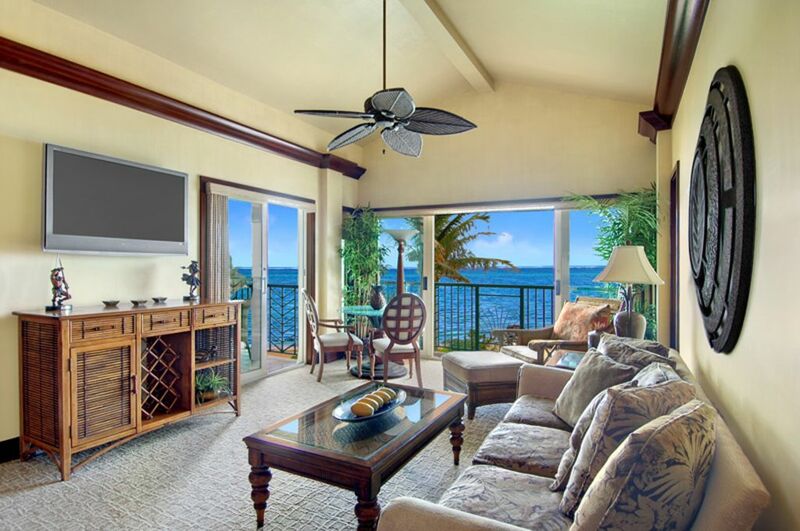 One of Waipouli Beach Resort's top 5 suites, this corner penthouse has sprawling ocean views from the living room, lanai and both bedrooms. Luxuriate in features like the stately kitchen with a Wolf glass cooktop & oven, Sub-Zero refrigerator, GE profile microwave, Fisher Paykel dual dishwasher drawers, granite counter tops, African Mahogany cabinets, three full bathrooms with Peruvian Travertine stone surrounds and two soaking tubs. With furniture selected and designed by the renowned interior designer, Philpotts and Associates, this award-winning penthouse suite has 2 bedrooms and 3 baths, comfortably accommodating 5 people. Enjoy the clean design and convenient location, with the beach and boundless Kauai adventures just beyond your private lanai. East Kauai is incredible... Sunrise, bike path, luxury, halfway to each side of the Island, AVEDA, groups, beach bar, pools, waterfalls, powdery white sand on a silent and empty beach with shade. WOW.... Bike path, private chef in the room, yoga in old Kapaaa town, Papayas heath food store, Safe way shoping to cook in our incredible kitchens. Great times at Waipouli Beach Resort with the incredible ukulele player at the beach bar!! We loved everything about the hotel and our room. We will definitely be staying here again. The only real negative that we saw was that the resort itself might need some cosmetic repairs soon like the stucco chipping off in places. FABULOUS! Perfect building location with an absolutely Stunning view. Parking was easy and located close to unit. Beds were great for comfort and the overhead fans made sleeping a breeze. We loved the code for entry into the room and pool with no need to keep track of a key. No disappointments. Better than expected. We have stayed in this condo several times over the years. Always well maintained and of course we love the ocean front experience. Fantastic view with great accommodations. Almost everything about the rental was great. Only issues were 1.) there was only 4 coffee cups, 2.) there was only 3 spoons, and 3.) the fan on the HVAC ran all the time except when the doors were open. KAUAI IS INCREDIBLE! Our new bike path is near.